Being a dedicated participant in road races like the Eastwind Running and Endurance Club's annual Resolution Relay is challenging enough for able-bodied runners. Many athletes train for months to prepare for races, especially those in the 13-to-26-mile range. Endurance is the name of the game. For those with disabilities, the sensation of wind on one's face while racing is rarely achievable. 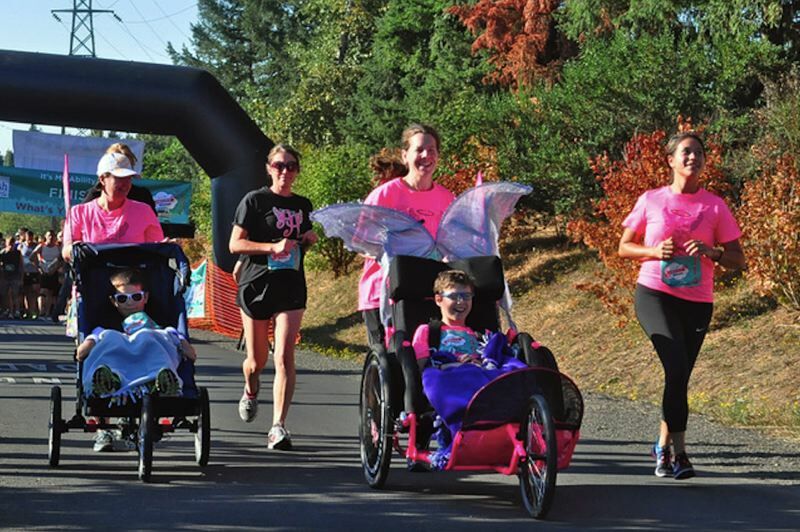 Enter Ainsley's Angels — a nonprofit organization founded by Kim and Lori Rossiter in 2011, to help the disabled enjoy the thrill of the race. The pair named the group after their daughter Ainsley Rossiter, who died from complications with Infantile Neuroaxonal Dystrophy (INAD) in 2016. The organization couples runners — dubbed as "angels" — with people with disabilities, or athlete riders, to allow the riders the experience of a race. Runners train not only for long distance running, but doing so while pushing a rider in a large, specialized stroller known as a running chariot. 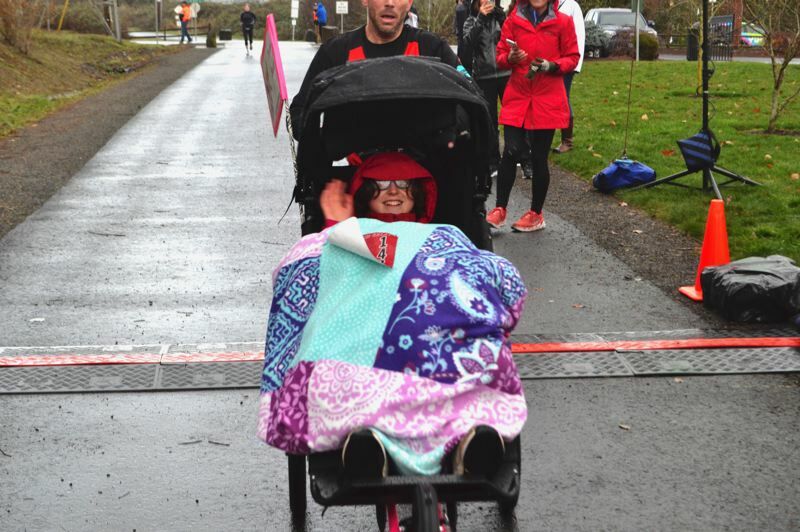 The Rossiter family had a history of running, and found that through the use of a chariot to carry Ainsley, they had "a therapeutic means to fight the devastation associated with learning and trying to live with the fact that sweet Ainsley had a terminal illness," according to the Ainsley's Angels website. "When Ainsley went for her first jog during a local road race in 2008, she gave a radiant wind-induced smile that anyone would envy," the website notes. The possibility of producing smiles like Ainsley's is just one reason Sandyite Karen Thygesen decided to form her own ambassadorship, or chapter of angels, in northern Oregon three years ago. She also has a very close friend who lives with a congenital heart defect. "Kim always wanted to participate in a race and she always saw me run," Thygesen noted. "She always felt like she'd be able to run when she reached heaven." On a chilly morning full of anticipation, Thygesen introduced her new endeavor to the Boring community with an informational booth at the 2016 Resolution Relay. Thygesen's friend Kim was the Oregon contingent's first athlete rider. Since the inception of the Northern Oregon Ambassadorship of Ainsley's Angels, the number of angel runners and athlete riders associated with Thygesen's efforts has grown. At this year's Resolution Relay on Dec. 30, 18 runners lent their legs to push five riders from all over the state through the half-marathon course. 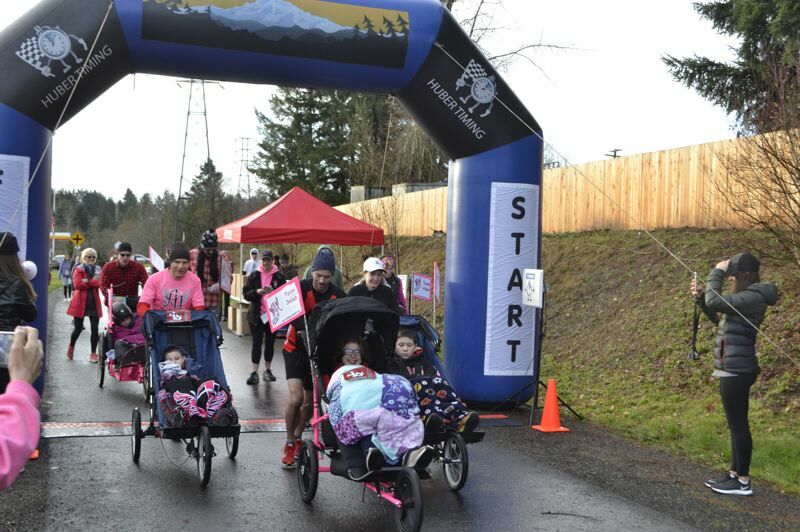 "They're going to help them become half-marathoners," Thygesen told The Post as the runners took off from the start line at Boring Station Trailhead Park. Athlete riders with Ainsley's Angels vary in ability and age. Several travel all over the region to participate in races. 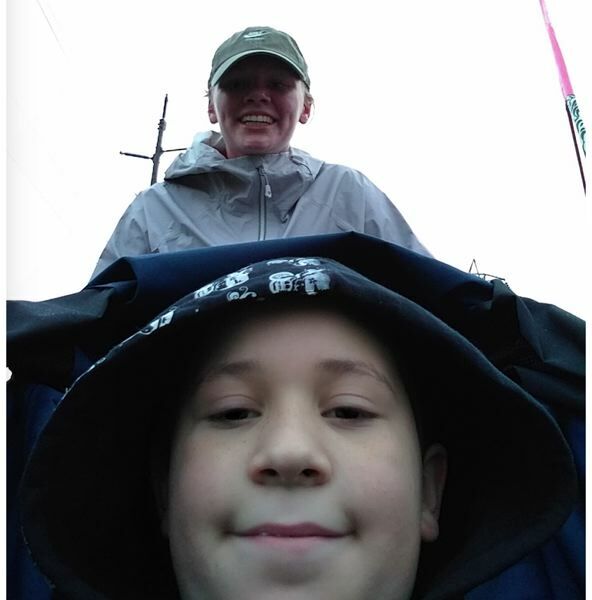 For 11-year-old Alex Riedl and his mother Katie Riedl, the trek to Boring wasn't far from their Portland residence. The Boring trail is also where Alex competed in his first race — the It's My Ability 5K — two years ago. Alex was diagnosed with juvenile rheumatoid arthritis (JRA) at the age of 3. JRA is an autoimmune disease, which can often cause the body to mistakenly attack some of its own cells and tissues and lead to chronic joint stiffness and swelling. Katie, who considers herself a young mother, said having a child at 18 was a learning experience in itself. "To be thrown into a situation like this (where) one minute your kid has a swollen joint to the next he's having to have chemo — it was difficult," she noted. In some cases of JRA, low doses of methotrexate, a chemotherapy drug administered by injection, is prescribed in order to slow joint damage. When the family first learned about Ainsley's Angels from Karen, Alex was hesitant. But now "he loves doing this," Katie said. "It's great to have this organization for these kids who don't otherwise get to do these things," she observed. Alex recently participated in his first triathlon, where he was pushed for the running portion, pulled in a cart for the biking section and towed while lying on a raft for the swimming segment. "That's something he'll never be able to do on his own," Katie added. "To be able to do that is really cool." Besides offering an experience Alex wouldn't otherwise have, Katie said she's appreciated the community Ainsley's Angels provides. "I didn't even know about half of these disabilities before, (and you don't really understand) until you're around people and hear their stories," Katie said. "It's nice to know you're not the only one dealing with these struggles." Arden Bryce joined Ainsley's Angels as an opportunity to still race despite her daughter's disabilities. Arden and her 17-year-old daughter, Selah Bryce, have competed in multiple races in Washington and Oregon over the past year and a half. Selah has autism and dyspraxia, a developmental coordination disorder, and can't run races herself, but delights in being pushed through the courses by her mother or another angel runner. "I used to be a runner and I wanted to get back into it," Arden explained. "I started looking at running chariots because in order to run I'd have to transport my daughter with me." Now, even when Arden doesn't run a race, Selah enjoys riding with one of the group's other riders. She's especially formed a bond with Boring-based runner Chris Stubblefield, who ran with her at the most recent relay. "She just likes to come and have fun," Arden noted. "It's an amazing organization. I always encourage others to join. Even when you, as a runner, are tired, the joy the rider is experiencing is enough to keep you going." 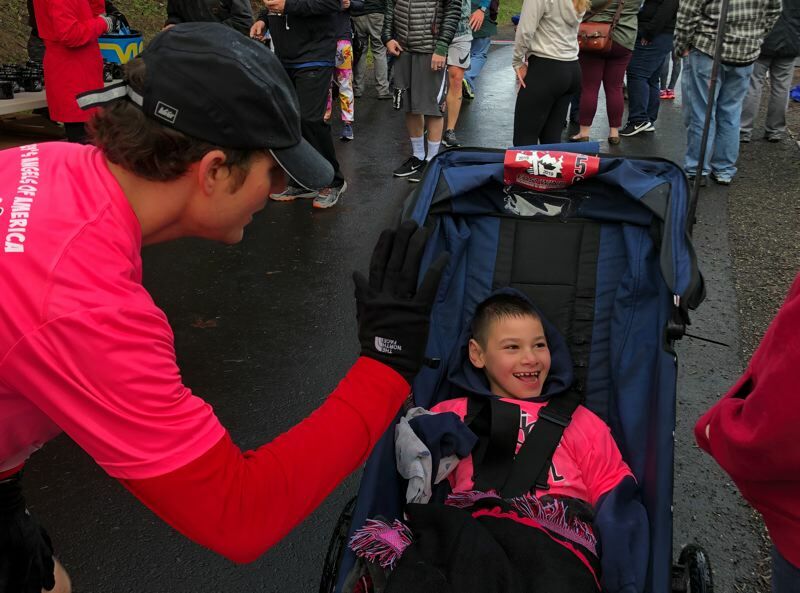 The 2018 Resolution Relay was Portland runner Monica Wells' first race with Ainsley's Angels, and she enjoyed spending time with Alex Riedl while pushing him along the course. The experience was so positive she will "absolutely" participate as an angel runner again in the future. "I love the idea of running for someone who can't run for themselves and letting them experience a race," Wells noted. The Eastwind Running and Endurance Club, which hosts the Resolution Relay, also has several members who are angel runners. Though the annual relay acts as one of the club's largest fundraisers for its local athletic scholarships, the club also tries to promote Ainsley's Angels and help with the group's fundraising endeavors. "Our goal is to be supportive of people in their own goals," said Claudia Peterson, running club president. "We also support anyone who wants to be actively involved in reaching out to help others have the experience of participating in an event." Everyone who participates in the Resolution Relay is tasked with creating a resolution they strive to accomplish in the new year. For Thygesen, her resolution is a bit different than some of the usual weight-loss goals and behavioral changes. "My resolution for the group is for it to grow and double in size by next year," Thygesen said. "The excitement and joy that the riders get is just priceless." Unfortunately, the experience isn't "priceless." The nonprofit group fundraises constantly to purchase more running chariots. "The more chairs we have," Thygesen noted, "the more people we can (allow to race)."